We had a shortened week of school this week. My hubby and I had an overnight trip planned so the boys had the end of the week off from school. It's also why I'm posting our weekly wrap up a day early because our week is DONE! I think the boys were looking forward to us going away almost as much as I was looking forward to getting away. We spent Monday on a field trip at the zoo so it was a pretty lightened load of schoolwork this week. 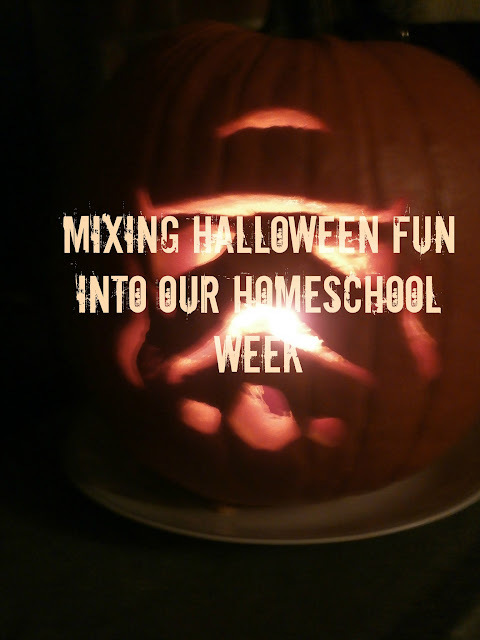 With Halloween coming up this weekend we tried to incorporate lots of fun "Halloween" type stuff into our week. Luckily, the boys worked extra hard on those two days we actually did school knowing they had a few days off to look forward to. Science-- All three boys finished up their display boards for the science fair. We also spent a full (chilly!) day at the zoo observing all the animals. It was a Halloween themed day at the zoo; the kids wore costumes and got to trick or treat around the zoo in the various shops and buildings. The Zoo Boo days are always so much fun. Many of the animals were very active and I swear the monkeys were playing peek a boo with the kids! We heard lots of animal noises and got to feed the parakeets. The boys spent quite a bit of time looking at a gem chart we found reading the names and trying to memorize what the rocks looked like. We've been watching the geese at the lake; this time of year we get a LOT of geese stopping by on their migration journey. They're loud and arrive in small groups by by the end of the day the lake often looks pretty full. Look at all the geese! Math-- They each completed 6-8 more pages in their math workbooks. Evan and Alec wanted to buy some new toys at the zoo and reminded me that they had money at home. Once home they had to figure out how much they owed me, counted that out of their banks and wallets, and then Evan decided to recount what money he had left over. We've checked out lots of candy math books from our library in preparation for next week and putting our Halloween candy to good use. Reading and Language Arts-- Evan read Follow Carl, Leaves, and part of Pumpkin Day, Pumpkin Night. Alec finished reading Tombquest and picked out three new books series to try while at the library. He started reading Seaborne. Ian started reading Nasty, Stinky Sneakers. Evan completed a few more pages in his Star Wars reading book on his own in the car one morning. He had no problems with it all and told me that with the word forest he tried to see if he saw any smaller words inside it then when he saw the word for he sounded out the rest. The older boys worked on their cursive for a bit and they all spent a bit of time on their spelling words this week too. We began listening to So You Want To Be a Jedi in the car and we're enjoying it so far. We read a few Halloween stories too just for fun. Physical Education-- We went roller skating one night as a family, meeting up with my sister and nephews. It's been awhile since we've taken the boys and they had so much fun. It was a lot more work than they had remembered but they still enjoyed it. Alec kept challenging himself by trying to squat down and lift one let up while skating so he could participate in the shoot the duck contest next time. The boys also had karate this week and we spent an entire day walking around the zoo. History and Geography-- We're still plugging away on our books Cracker! and Who Was George Washington? We're already trying to decide what we want to focus on for our next history unit now that we'll be leaving Vietnam behind. We'll revisit the Vietnam war unit when the boys are older and we can watch some of the movies about it and cover it more in depth. For geography we spent quite a bit of time at the zoo studying all the maps and talking about the relationships between countries and the differences between countries and continents. We talked a bit about the history of Halloween and why scary costumes and frightening people seem to go hand in hand with it. Art-- The older boys carved pumpkin this week. We now have a storm trooper and a Minecraft creeper glowing in our living room at night. They worked really hard a did a great job. Alec has started taking quite a few photographs this week too. We noticed a beautiful sunrise one morning so I went outside to try and capture the bright pink, yellow and orange in the sky but all the colors were muted in the picture so Alec tried it with the camera on his Kindle. That sparked something and he spent the next few days photographing groups of his stuffed animals and whatever else struck his fancy. What a great short week. Trick or treating at the zoo! How awesome is that. It is awesome! They feed different animals pumpkins as a special treat too and it's fun to see them gobble it up or play with it too. What a fun idea, to incorporate math with Halloween candy! And I love the Zoo Boo trip! I also enjoy seeing what other children are reading for fun... My kids are bookworms and I am always looking for fun, new books to introduce them to! We often use our Halloween candy for all sorts of math and science lessons; we could never possibly eat it all! My middle son is also a bookworm and I too am always on the lookout for book suggestions for him. He tends to enjoy book series the most and is so upset when he gets to the end of a series. I know just what he means too-- it's like saying goodbye to old friends. I love the Minecraft pumpkins. We must get a bit more creative with ours next year. How lovely getting that close to the parakeets! It was all my middle son's idea! We have carved non- traditional pumpkins in the past (last year he did a Pikachu). We started looking for templates on Pinterest one year and once they realized all the possible choices they just started thinking outside the box. This year Alec told me a creeper would be both fun and easy since they're all squares and rectangles. So I looked and sure enough there were plenty of Minecraft creeper templates on Pinterest and it was super easy for him to do on his own. Great pumpkins! Although we did a little carving this year, it's never been something the kids have been "into". None of them ever want to touch the pulp! LOL What a great day at the zoo! I don't blame them; I can't stand the pulp either. Even just the smell coming out of the pumpkin as we open it makes me a bit queasy. Luckily my oldest doesn't mind at all and often helps his brothers out too.